seshooteatrepeat/Shutterstock Many people protest fracking, knowing that it is bad for both the environment and the people in affected communities. “What the frack is going on, with all this fracking going on?” was the theme song of my sophomore year in high school. It is from a highly recommended, educationally relevant music video by David Holmes. To give you a slightly more unimaginative gist of the song, “fracking,” or hydraulic fracturing, is a shale gas and oil recovery technique achieved by drilling deep pits into the earth and flooding them with a high-pressure mixture of water, sand and chemicals, thereby allowing space for gases to rise — a process that fractures the rock. Environmental issues with this process have already been raised; they concern fracking’s use of absurdly high quantities of water, earthquake associations and the escape of carcinogenic chemicals that contaminate surrounding groundwater. Because fracking promotes a continued reliance on fossil fuels, it discourages governments and corporations from investing in renewable sources of energy. 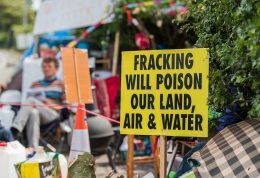 But the environmental concerns actually highlight another deep-rooted problem: fracking’s role in propagating environmental injustice. Environmental justice, to start, is a concept born out of the civil rights movement during the 1960s. Founded on the idea that the varied costs of industrial development shouldn’t be disproportionately dumped (both literally and figuratively) on poor or minority communities, it stresses the correlation of industrial development and areas of low-income residents. Pennsylvania, home to a portion of the Marcellus Shale, an almost 95,000-square-mile rock formation that also stretches across parts of New York, Ohio and West Virginia and holds trillions of cubic feet of natural gas, sees the detrimental effects of fracking. Environmental researchers were called in to test the estimated exposure to possible gas well pollution, noting that exposure was significantly higher in poor Pennsylvania communities. From a sociological point of view, this raises environmental justice concerns, as communities under the poverty line generally have less mobility and access to information regarding the potential dangers of contaminated water and release of toxic gases. Recent findings have found that common fracking chemicals pollute the groundwater feeding three homes in Bradford County, Pennsylvania, where the median household income is 10 percent lower than that of the rest of Pennsylvania. Researchers have reported that the world’s second-leading cause of lung cancer, radon (a radioactive chemical), is more common in areas near those wells as that in those same locations. Similarly, sulfur dioxide emissions spiked 57 percent from 2012-13 near Pennsylvania natural gas sites. Sulfur dioxide has been linked to harming the respiratory system and can cause or worsen asthma. As pictured in Josh Fox’s Oscar-nominated and Emmy award-winning documentary “Gasland,” Pennsylvania residents are finding their groundwater (and thereby home water) sources poisoned by local fracking plants, with high enough levels of methane running through their water system that the families of Dimock, Pennsylvania can literally light their water on fire. Under the administration of former President George W. Bush in 2005, fracking was made explicitly exempt from the Safe Water Drinking Act. The exemption gave fracking companies the freedom to inject toxic materials near underground sources of drinking water without reporting the chemicals or the quantities of these chemicals to the government or to the public. These are the same sources of drinking water that have been linked to the detrimental health effects exhibited by those who drink it. Let me make clear that an attack on the earth is an attack on its people. So if you stand for the protection of people, you stand for the protection of the earth. Call for environmental justice. Protest for environmental sustainability. Fight the frack.